At the time of writing this article I’m sitting in the sports book at the Mandalay Bay Hotel & Casino (with no wifi thank you very much). Manny Pacquiao happens to be staying here and the overwhelming presence of “PacMan’s” team members and supporters is a testament to the support of his fanbase. Mayweather is stationed at the flagship MGM property the “MGM Grand.” I can’t help but notice that there doesn’t seem to be nearly as many people walking around with Floyd Mayweather or “The Money Team” regalia. As far as the court of public opinion goes I guess I’ll throw my hat in the ring (no pun intended). I’ve been around the fight game in many iterations for a large part of my life. So, I’ll impart what I consider knowledge. Let’s start out by saying for the sake of transparency that I am a Mayweather fan. Correction, I’m a fan of Floyd’s boxing skills and what he’s accomplished inside the ring. His out of the ring activities and brashness I have no respect for at all. But, that’s one of the reasons his fights sell so well. Some people want to see their boisterous, undefeated champion ply his trade, then walk off into the sunset. Conversely, opposing fans want to see the brash, loudmouth guy get his block knocked off. Both of those viewpoints equate to the same thing, asses in seats and pay-per-view buys. Stephen A Smith and Skip Bayless both have their points in the ESPN First Take video above. However, Skip was wrong. It wasn’t that Floyd was shamed into taking the Manny Pacquiao fight. From Floyd’s end, it was all business, a stratagem if you will. The average fan doesn’t understand what a boxer with Floyd’s record stands to lose a from a defeat. A single loss on his record would impact his bottom line earnings in the area of 20 – 50 percent. Especially, if he’d have done this during the middle of his career when he was going to fight another 20 plus fights. That figurative 20 – 50 percent impact could have been an immense amount of money. Floyd is a brand, a business if you will. What business do you know that would do something to negativey impact their bottom line by 20 percent or more? Another piece of the stratagem could have been to let Manny get a little older, get a little more beat up, possibly suffer a loss in order to strengthen his position in negotiations. Or, maybe to let him get more involved in his out of the ring obligations. Paquiao’s loss to Marquez could have actually pushed Floyd’s timeline a bit. Suffice to say that if Manny where to take another defeat, the interest in this fight would surely have taken a hit. Floyd knew he was going to fight Manny at some point. We all knew that! This was and is necessary for his legacy. Floyd could not have ended his career with what essentially would have been an asterisk next to his name. Now let’s talk about the fight. I love Floyd’s style. While it may not be the most exciting to watch for the layperson or occasional boxing fan his skills are undeniable. Floyd is a “sweet science” savant with a boxing IQ unequaled amongst his peers. Floyd has mastered the most important part of boxing, which is not getting hit. “Money” makes fighters look amateurish with his throwback style shoulder rolls, head movement, feints, nimble footwork and sharp counter punching. These are Mayweather’s hallmarks. Integrate these traits and we have as we’ve seen pretty much an unstoppable force. With the previously aforementioned attributes what weaknesses could he have? Well, one his greatest asset’s could be his greatest downfall in this fight. That asset is his defense. He is primarily a defensive minded, counter puncher. At times he stays in his shell looking for counters and studying opponents for an extended period. He won’t be able to do that in this fight, Manny is too high pressure and has too much power. Another detriment is his lack of one punch knockout power. I say one punch knockout power because he can stop opponents, although he hasn’t in some time(I don’t count the Ortiz fight). When Floyd does stop his opponents it’s from an accumulation of punches. One last thing I’ll pick on is his punch output. Being a counter puncher you wouldn’t expect him to throw 100 punches a round. But, I think he’ll have to pick it up considerably this time out. Also, I’d prefer to see Roger in his corner as opposed to his father. Make Manny be Manny. Make him come find you, make him miss and make him pay. I also love Manny’s style (I know I said that about Floyd as well but styles make fights). What I love about Manny’s style is the fact that he comes to fight. He’s coming after you and there’s going to be a war. Manny’s style is an extremely judge and fan friendly style to watch. The downside to his style is that he leaves himself open when attacking and it’s cost him as we’ve seen a few times already. One of “Pac Man’s” best attributes is his warrior mentality. He’s aggressive. He throws a lot of power punches. He uses unusual angles and he’s fast (I’d say that Money is quick and Pac Man is fast). Another of his strengths is in fact his strength. He’s an incredibly strong power puncher. He unlike Floyd does have one punch knockout power. Pac Man’s main weakness is also his greatest strength. His aggressive nature combined with his sometimes lax defense could be a serious problem. We saw this in the Juan Manuel Marquez fight. This will especially be the case if he’s unable to consistently put hands on Floyd. Pacquiao takes too many shots for a fighter of his caliber. More of his fights are wars than need to be. Age could also play a bit part. As I said before Manny takes a lot of shots and has had a lot of knockdown drag out fights. I’d say Floyd at 38 looks better than Manny at 36. Not to mention he’s had more bouts than Floyd has. Multitasking, Pacquiao also has a lot of outside distractions pulling him in many directions. He has political obligations in the Philippines, an acting career, and he’s a successful singer . Pac Man is a professional, so he should be ready. Desire, this is a tricky one. Used properly it can fuel you and propel you to glory or it can cause you to burn out and make mistakes. Pac Man has wanted this fight for 6 long years. The best thing for he and trainer Freddie Roach to do would be prepare for this bout just like you would any other bout. Constant Pressure. Throw punches in bunches. Attack from angles. Don’t stand in front of him. Head movement with hands up. If Floyd goes into shell, go to the body. Turn it into an ugly war. Don’t try to outbox Floyd. Manny can knock Floyd out, but he’ll have to catch him. Throughout the years that has never been an easy task for anyone. When Mayweather has been “hurt” he’s handled it well (ala Shane Mosley). If “Pac Man” tries to box with Floyd I see it being a long night for him and ending in a loss by decision. UPDATE: All week Floyd has been touting himself as the greatest ever. Even greater than Muhammad Ali? As far as a technical boxer I can’t argue with him. George Foreman even agrees to that. But, what has he done to help the human race to change things for the better? What has he sacrificed for the betterment of society? I don’t remember him even commenting on any of the hot button issues going on in the world or this country. So, as a boxer he could possibly be the best we’ve ever seen. But as far as an icon, a beloved luminary or a historic figure, Floyd doesn’t even register in comparison to Ali. 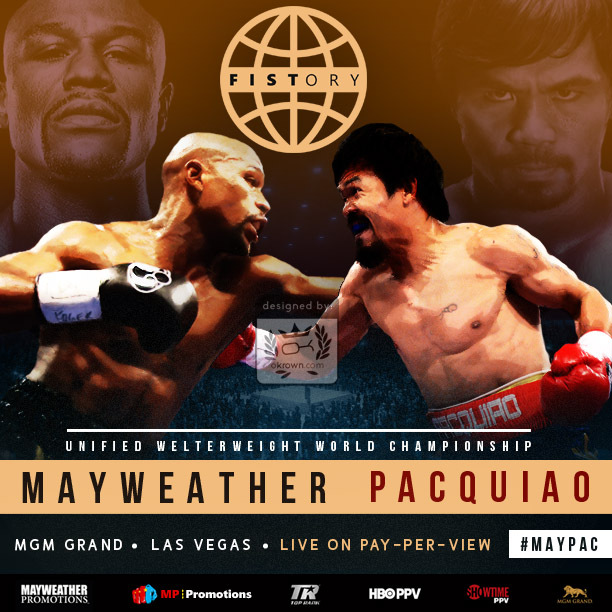 This entry was posted on April 30, 2015 by leon in Business, Entertainment, Hot News, Sports and tagged boxing, Floyd Mayweather, Las Vegas, Manny Pacquiao, May 2nd, Mayweather, MGM, sports.